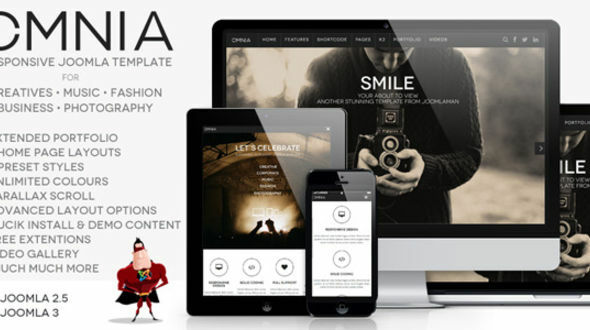 JM Omnia is Joomlaman’s latest multi-purpose professional Joomla 2.5 & Joomla 3 template. With its clean and professional design, it’s one of the best templates for personal portfolios, creative agencies, corporate businesses, photography businesses and fashion companies. With its intuative administrator panel and full documentation it can be easily adapted to suit any size of business including individual, small or large corporations. The template is fully loaded with extensions and features to help you create a stunning and slick. Using the Revolution Slideshow you can easily create stunning animated slideshows. The template also boasts unlimited parallex modules to give the template a slick creative edge.